EAGLE GROVE — Margie Kathryn McCollough, the daughter of John H. and Emma (Arnold) Tapper, was born August 15, 1923, at home on a farm near Webster City. She was baptized in the Presbyterian Church at Kamrar. She was raised and educated in the Kamrar area, attending country school and then graduated from Kamrar High School in 1940. Margie married Jay W. McCollough on June 4, 1939 in the Methodist Parsonage in Garner, IA by Rev V.V. Schultz. The couple farmed near Webster City, Blairsburg, and Eagle Grove. Margie was a homemaker and made wedding, anniversary, and birthday cakes for over twenty years. After her husband Jay passed away on September 27, 1975, she began working at Dodger Manufacturing when it opened. She was a supervisor there for eight years before retiring. Margie also served her community well. She was a 4-H leader for 10 years, served on the Wright County Extension Council for 12 years, Foundation for the Future Board for 3 years and on the Eagle Grove Library Board for 37 years. Margie was a 50 year member of Eastern Star, White Shrine, and Troy Culture Club. She enjoyed preparing Thanksgiving dinner for her whole extended family, which she had done for 75 years, through Thanksgiving 2016. 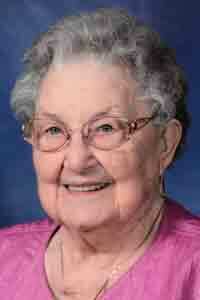 She was a member of the Eagle Grove United Methodist Church, where she held many offices and chaired many committees. She started a prayer shawl ministry there in 2007 and was working on her 677th one recently. With hardly any vision, she enjoyed listening to books on tape and crocheting. Margie passed away on Thursday, August 9, 2018, at the age of 94 years. She was preceded in death by her parents; husband, Jay; sister, Arlene White, and brother, Weldon Tapper. Survivors include her children: Brian (Nancy) McCollough of Stafford, VA, Cameron (Susan) McCollough of Armstrong, IA, Camille (Dan) Rogers of Fort Dodge, and Alan (Kim) McCollough of Goldfield; 13 grandchildren; 30 great-grandchildren; brother, John (Joan) Tapper of Kamrar; sister, Bernece Frohling of Lohrville; sister-in-law,Anne Tapper of Webster City and many nieces and nephews. Memorial services will be held on Wednesday, August 15, 2018 at 10:30 a.m., at the United Methodist Church in Eagle Grove with Pastor Jim Roth and Pastor Dan Rogers officiating. Visitation is Tuesday, August 14, 2018, from 4:00 p.m. to 7:00 p.m. at Foust Funeral Home in Eagle Grove. Burial will be in Rose Hill Cemetery in Eagle Grove.